Stokvels, or savings and credit associations, have great potential in the formal financial services sector. Mampudi Nkgadima, MD of market research company African Response, has always believed that stokvels held more financial power than the formal financial sector gave them credit for. Being a member of several herself, she knew that the long-held perception that stokvels are used only by older women in rural areas with little buying power was a myth. Since African Response released the results of their first comprehensive study on stokvels in 2011, the company has been inundated with requests, she says. Suddenly stokvels are in vogue and everyone from banks to advertisers want to know how they can get their hands on this ZAR25 billion market. Nkgadima runs workshops where the nature of stokvels and how they function are explained to create better understanding. Essentially stokvels are rotating savings and credit associations, normally involving friends, family or neighbours, who pool their funds to save for birthdays, funerals or groceries. Everyone contributes equally and takes turns benefiting from the pooled funds. The name likely originates from 19th century stock fairs held by settlers in the Eastern Cape, but the concept is not unique to South Africa. Similar structures have long existed in Egypt where they’re known as ‘gameya’, in Scotland (‘menages’) and Korea (‘kye’). However, in South Africa stokvels became vital sources of finance during apartheid when black South Africans were largely excluded from the formal financial sector. 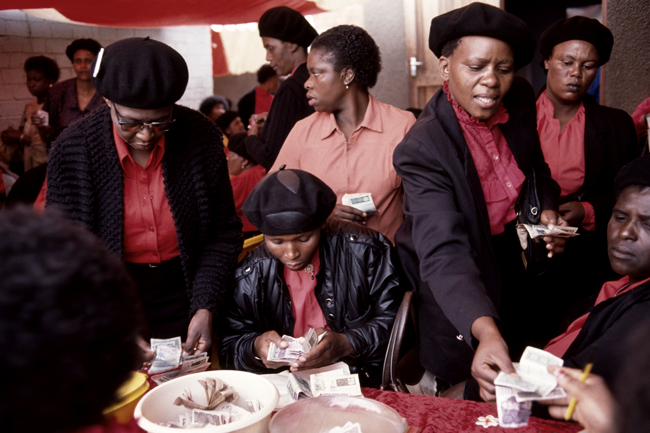 ‘As a consequence of the marginalisation of the black population, people had limited access to finance and services. Relying on each other to access capital, they started to form different types of associations based on their immediate needs,’ says Mizi Mtshali, chief operating officer of the National Stokvel Association of South Africa (NASASA). Twenty years into democracy, these savings societies are still as relevant. African Response’s 2014 study found that 23% of South Africa’s adult population belongs to at least one stokvel. ‘From the 2014 study, what was very key was the prevalence of burial societies,’ says Nkgadima. This is a noticeable difference from the 2011 study, which found savings stokvels were the most prevalent. The number of members per stokvel can vary significantly. On average, burial societies have more members (39) while birthday stokvels only have 12. The research also found that whereas burial stokvels tend to have a strong female bias (63%), investment stokvels generally see a slight male and upper-income bias. ‘From this research we see that people are consolidating. In 2011 people belonged to more types of stokvels, but now we are seeing that they might belong to one or two stokvels, instead of four or five,’ she says. According to Mtshali, these savings societies are branching out from their traditional mandate. ‘Groups now have a multitude of options and are starting to explore solutions beyond their original function. ‘An example would be a burial society that collects ZAR200 [each] from a pool of 200 members. That group collects ZAR40 000 a month, which may amount to [more than] ZAR350 000 a year, taking into account that some of the funds may have been distributed during that year. This group would now be in possession of a large amount of money and would look to invest the bulk of it,’ he says. Former Finance Minister, Pravin Gordhan, when in office, lamented South Africa’s woeful savings rate. In 2012, it was just 14.7% of GDP, while some of its BRICS counterparts could boast rates of 30% (India and Russia) and 51% (China) – Brazil’s savings rate was similarly low at 15%. Even if more stokvels kept their money in a bank (currently just 41 % do so) it wouldn’t make a significant dent in South Africa’s savings rate (the country’s 2014 GDP is sitting at around ZAR3.7 trillion, with stokvels representing less than 1 % of that). What is significant is how successful the stokvel model is in encouraging people to save. If that can be replicated it would have a positive effect on the South African economy. ‘What the stokvel model has proven is that individuals save better as part of a collective,’ says Mtshali. However, the social pressure to keep contributing to a stokvel can, at times, be so intense that the good intention of encouraging people to save can ironically lead to risky financial decisions. NASASA started a year-long campaign in July to host stokvel indabas in every major township in South Africa. The theme was ‘Co-operative Power’, and harnessing that power could have positive implications not only for South Africa’s economy, but for companies that can successfully provide products to meet the needs of these savings societies. Nkgadima says that financial services should not focus as much on how they can get a share of the stokvel market, but instead on the way they can help these savings societies become sustainable ‘for the betterment of the economy’.